After getting engaged Charity and Brian were considering a local wedding in their home state of North Carolina. At about 3 months into the planning process Charity became discouraged and overwhelmed, the prices were outrageous. Charity said, “I did not want to settle on what I wanted for my wedding”. This was when Brian had the bright idea of looking into getting married in Punta Cana, a destination where they had their first vacation together. The resort the couple first stayed at in the Dominican Republic was the Majestic Elegance. Brian had remembered a wedding he had saw while they were vacationing, and it was gorgeous. Despite originally thinking it might be too costly, Charity began reaching out to travel agents online. After interviewing three separate agents, she found Ann with Destify. Ann won because she got their wedding date and initial contact started with Majestic’s wedding department within 24 hours. The couple arrived on Monday, October 22nd, and were immediately ushered in the Elegance Club, where they met their butler and a manager who notified the couple they had been upgraded to the presidential suite. The couple loved how beautiful the room was, with plenty of space once it came to getting ready for the big day. Their 32 guests arrived with minimal issues and warm greetings from the staff, and the couple agreed the level of service everyone received was fantastic. On the day of the wedding, the ceremony space proved to be magical. Although the garden gazebo is in the middle of the resort, that the decor, like the draping and flowers, made it feel like the most intimate place on earth. 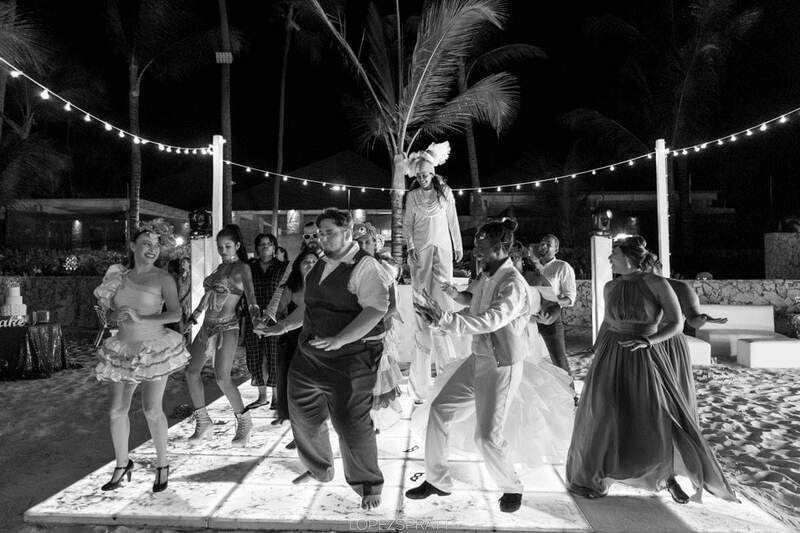 Following their beautiful ceremony, the couple hosted a reception on the beach, featuring delicious food, a DJ who had everyone dancing all night, and the Hora Loca; a unique inclusion featuring festive Caribbean music and professional dancers. The couple both agreed that they have nothing but nice things to say about their destination wedding. Between Destify and the wedding apartment, it felt like the wedding details were organized like science, and future brides need not worry about a thing. You are in the best hands, they really made my day the best day ever!